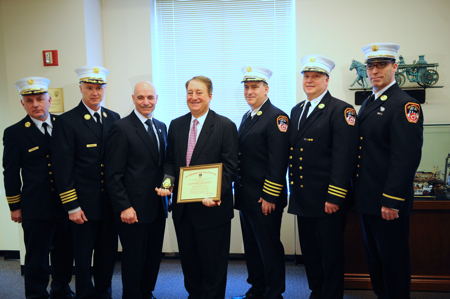 Howard Milstein, Chairman of New York Blood Center’s Board of Trustees, was sworn in as an honorary FDNY Battalion Chief by Fire Commissioner Salvatore Cassano on March 7. Mr. Milstein, who is also the Chairman and CEO of Emigrant Savings Bank, is a strong supporter of Sept. 11th-related charities and causes, including being a donor to and board member of the National September 11 Memorial and Museum. Following September 11th, he was instrumental in the COPE campaign, which offered post-traumatic stress counseling to first responders and their families. In September 2011, he dedicated the statue of The Kneeling Fireman outside the headquarters of Emigrant Savings Bank in midtown Manhattan. It is the only midtown Manhattan memorial to all first responders and victims of the terrorist attacks. 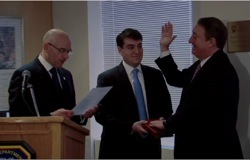 Fire Commissioner Salvatore Cassano swears in Howard Milstein, who is standing with his son, Michael.